When my kids were small they loved reading the Flat Stanley books. Flattened when a board falls on him in his sleep, poor Stanley is relegated to living life in an altered state, as a one-dimensional character. When my kids were small they loved reading the Flat Stanley books. Flattened when a board falls on him in his sleep, poor Stanley is relegated to living life in an altered state, as a one-dimensional character. What does Flat Stanley have to do with your business? Because a lot of companies have a Flat Stanley view of their customers: They think of customers only as one-dimensional characters rather than living, breathing, fully fleshed-out people. The consequence: Sales and marketing is based mostly on hunches or clichés, which means messaging and marketing isn’t as robust as it could be. It means your connections with your customers don’t run very deep, either. And it means your sales are (wait for it!) flat. Research from small-business consultancy Manta finds that less than half (49 percent) of the 1,115 small business owners it surveyed have a documented strategic marketing plan in place that includes defined target customers and key marketing channels, among other things. Why does knowing your perfect customer matter? Because greater insight into your customers means you can put your business or products in the context of your customers’ lives. You can communicate on your website, email, and in social media in a way that truly resonates with the people you are trying to reach, and that forges lasting connections (which makes for repeat business, or more referrals). And it means you have a clearer sense of who your best customers are, so you can pay more attention nurturing them… and waste less time chasing after those who won’t be a great fit for you, anyway. Having customer insight means being able to get inside their skin so you truly understand what makes them tick. And it means you have more flat-out (!) fun: As a business owner, you’ll know what people you’re targeting will find funny, or sad, or awesome (or not); you aren’t just a business selling stuff to people, you’re giving people a reason to care about you because you’re furthering a shared mindset; and you’re the leader of a kind of squad. And isn’t all that—freedom, fun, leading—part of the reason you’re in business to begin with? What we’re talking about is developing “buyer personas” in marketing speak. It’s a terrible buzzword, I know. But it means simply this: Personas are a proxy for the real people who are your ideal customers. You might have only one or two ideal customer profiles, or you might have more—depending on the nature of your own business.So where do you begin? You can’t afford to buy this kind of research help. The good news is you don’t have to. There are plenty of places to look—for free—that will deliver the insights you need. Gather as many business and product reviews as you can find, from as many sites that apply to your business. You are looking for those who love you, but also those who loathe you. You’re looking for customer insight. So for this purpose we’re looking less at the reviews themselves and more at who is writing, and how they are communicating. Look for demographic patterns: Who is buying? Men? Women? Who leaves more positive reviews—men or women? What about negative? What job titles do they have? Look for clues about how they communicate: Do they write in full sentences? Do they use emojis? Slang? Abbreviations? Do they use video testimonials? That can give you a sense of the age range you generally talk to. Some sites, like Amazon and Yelp, allow you to see reviews of other products (or services and businesses). So if your own reviews aren’t fully fleshed out or there aren’t enough of them, reviews of other products similar to your own could offer insight. Create no more than five multiple-choice questions for this purpose, depending on the tool you choose. Ask the right questions. Remember, your goal is to get a sense of who your prospects or customers are. So make it about them, not about you. What’s the biggest challenge you have with [your industry/issue]? What sites or magazines do you subscribe to? What Netflix show did you last binge-watch? Even in our online world, nothing beats face-to-face. You can ask them one or two (or more) of these questions conversationally. And then… keep mum and listen! 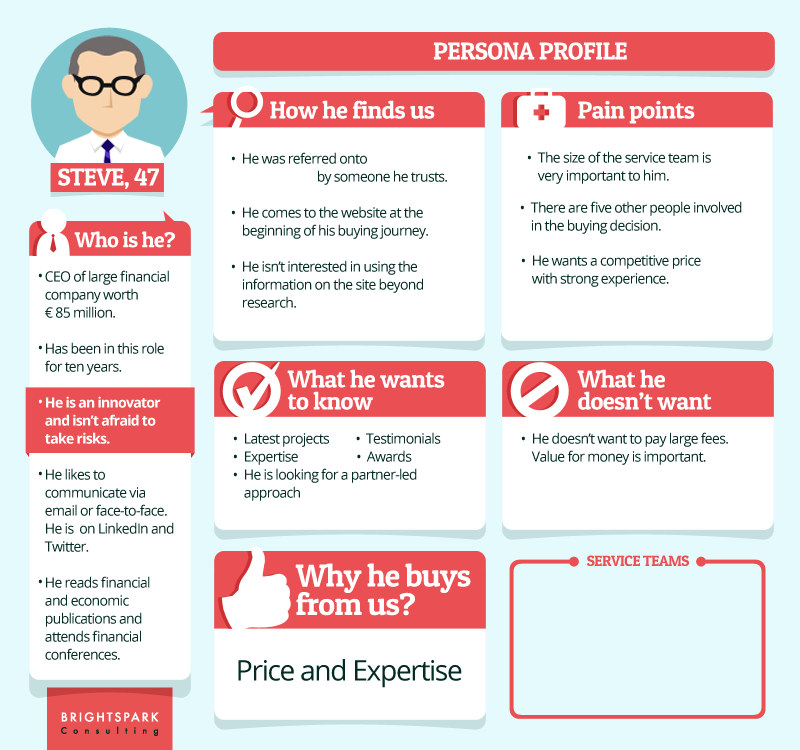 You can use the information you’ve gathered to create actual customer personas like this one. Or you can simply absorb the data you’ve gathered to make smarter and better decisions about how and where you’re talking to your audience. Because smarter and better is, after all, the goal.